While traditional school districts are characterized by a relatively unchanging stock of schools, performance-based systems with effective parental choice mechanisms and rigorous school oversight are defining the changes taking place in places like New Orleans, DC, and Denver. These systems have one unique common denominator: dynamism, a central concept in modern economics that explains how new, superior ideas replace obsolete ones to keep a sector competitive. The process happens through the entry and exit of firms and the expansion and contraction of jobs in a given market. As low-performing firms cease to operate, their human, financial, and physical capital are reallocated to new entrants or expanding incumbents offering better services or products. Too little dynamism and underperformers continue to provide subpar services and consume valuable resources that could be used by better organizations. Too much dynamism creates economic instability and discourages entrepreneurs from launching new ventures and investors from funding them. Dynamism, however, rarely comes up in discussions about education policy despite a growing number of urban education systems closing chronically underperforming schools and opening new, high-potential schools as a mechanism for continuous systemic improvement. New Orleans’ system of schools has operated in this reality since Hurricane Katrina. And others like Denver and DC are implementing their own versions of dynamic, performance-based systems. To illustrate, below is a graph of charter school dynamism in DC between 2007 and 2018. This entry was posted in Accountability, Education Governance, Education Innovation, Education Policy, Equity and tagged Accountability, charter schools, DC, Denver, District of Columbia, dynamism, Newark on July 16, 2018 by Jason Weeby. Collecting macroeconomic data in the education sector is currently a dreadful experience. For example, my team and I recently calculated the number of traditional, charter, and private schools opened and closed in four major U.S. cities during a specific period of time to show whether poor-performing schools are closing and new schools are opening to serve students. It was oddly difficult to know with certainty how many schools opened and closed in each city, to say nothing of gathering more sophisticated data such as annual expansions and contractions in enrollment and the labor force. So I was thrilled to see the U.S. Bureau of Labor Statistics (BLS) aiming their analytic heft at the education sector with a report released last month entitled “Labor productivity growth in elementary and secondary school services: 1989–2012.” According to the report, “Labor productivity is a statistical measure that relates an industry’s output of services to the quantity of labor required to produce those services.” In other words, it answers the question of whether the juice is worth the squeeze. In this case, we’re talking about teachers and other school employees in K-12 public and private schools, such as librarians, guidance counselors, administrators, and student support staff. Inputs are measured using a combination of number of full-time equivalent employees and cost from salaries and benefits. Outputs are measured using a combination of enrollment (volume) and NAEP scores (quality). Productivity data are important because they tell us how efficiently we are delivering education services. When combined with data on demographic shifts and practice and policy reforms, especially related to teacher preparation and hiring, we can see what’s working and at what expense. 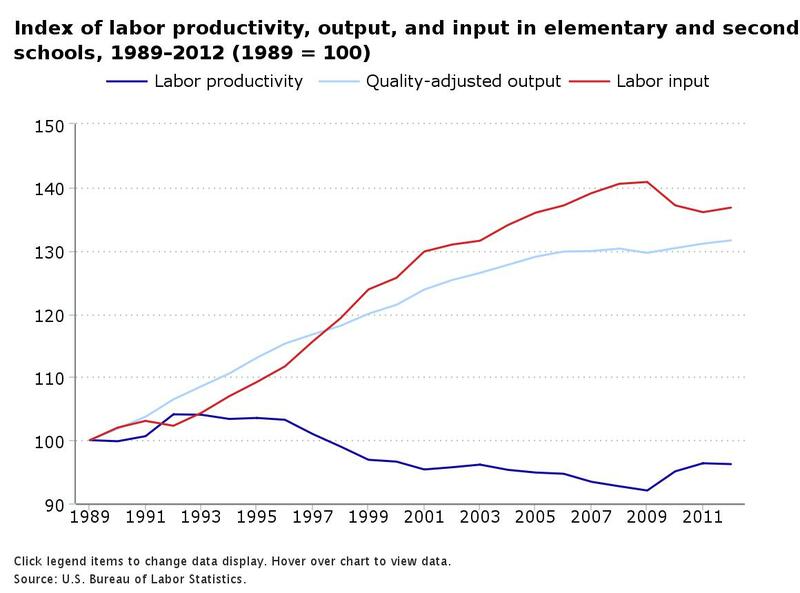 The biggest finding is that even though inputs and outputs have both increased steadily, labor productivity has declined by 0.2 percent per year, on average, since 1989. What you see in the chart above is that productivity declines when inputs score higher on the index than outputs. The report provokes many questions for me. Does the decline in productivity map to major education policies at the federal or state level? What’s the influence of broader economic trends on the K-12 labor force? Why didn’t private schools shrink their workforce at a rate commensurate to their enrollment decline? Macroeconomic data like these are becoming more and more important for the U.S. education sector, especially in cities where charter school market share is on the rise, private schools educate a significant proportion of students, and districts enter into charter-like contracts with their schools. Understanding the market and labor dynamics within a city’s schools is critical to understanding what’s working, what regulations need to be in place, and which areas to target for improvement. The private sector benefits from robust government reporting such as the BLS’s Business Employment Dynamics and U.S. Census Bureau’s Business Dynamics Statistics programs which collect, organize, and analyze critical market dynamic data. Education sector leaders will need similar data sets in order to make informed decisions. To do that, the BLS and other government agencies will have to collect and report data that can be further disaggregated by school type (district, charter, private, homeschool) and location (city, metropolitan statistical area, state). If the labor productivity report is any indicator, they’re on the right path. This entry was posted in Research, Talent and tagged Bureau of Labor Statistics, dynamism, innovation, labor, teachers, workforce on July 20, 2016 by Jason Weeby.